Did you know that the average office worker sits at their desk for almost six hours? Do you know how to sit on your chair properly to reduce the chances of getting back, neck or knee pain or even tingling in your hands and fingers? Pull up a chair (!) and I’ll talk you through it. A 2012 study by the British Psychological Society found that office workers spent 5 hours at 41 minutes at their desk each work day. That’s a LOT, especially when you consider that Australians reportedly work longer hours than our Pommy counterparts. How long do you spend sitting? Have a think; how many hours do you spend sitting at work? At your desk, at reception, in meetings. I reckon you’d be surprised how quickly the minutes turn into hours – and that’s before adding in the time we are sitting while travelling to and from the office. I did a little calculation myself and WOAH. Crazy numbers. Request a stand up desk (they’re all the rage, apparently). Even if you do your best to cut back on how long you’re sitting at work, the reality is that you still have to sit at your desk. Most importantly, you need a good chair. The chair needs to be ergonomically designed and be adjustable for seat height, back height and back angle. The sponsor of of this post, Progressive Office, kindly sent me one of their chairs to try out. My usual chair at work is actually quite similar to the number I’ve been testing for the last 3½ weeks, but my desk chair at home leaves a LOT to be desired. Running a web site and being a general geek, I’m at my computer a lot at home and work and it really shows when I’m not sitting on a decent chair. Sit close to your desk and keyboard so you’re not leaning in. Adjust your monitor so that you’re looking straight. Keep source documents and the like close so that you don’t need to move your head much, if at all. 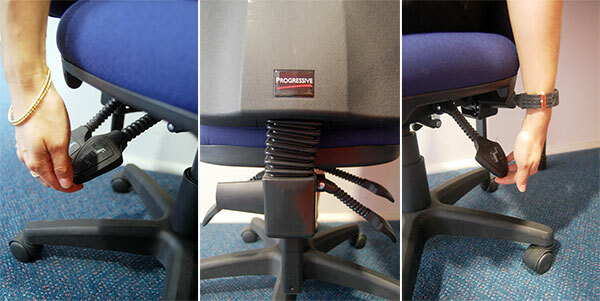 Progressive Office is a Melbourne-based company offering office furniture for over 25 years. They provide project management, layout and design services, a huge range of designs and even custom designs.